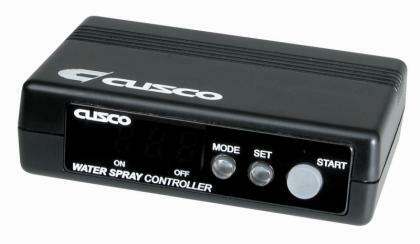 The Cusco Intercooler Water Sprayer, a great addition to today’s turbo charged cars. Unfortunately, sometimes it is not only difficult to push the button during hard driving but sometimes unsafe. That is where Cusco steps in. The Cusco Intercooler Water Sprayer unit allows the user to set specific intervals and rpm levels for the water sprayer to turn on and off. Whether you want a continuous spray for 30 seconds, an interval of one spray every 7 seconds, or a combination of different numbers, this controller has it covered to keep your intercooler temperatures down to a minimum. If you don’t have a factory water sprayer, no worries. You can wire the controller to utilize the windshield washer reservoir/pump to act as one. Cusco also offers a nozzle kit to work in these situations that is sold separately. Another feature of the controller is with the optional nozzle kit, the radiator can be sprayed as well, at the same timing of the intercooler.